Garrett County has taken the first step towards reducing its electricity costs with a community scale wind project by participating in the Maryland Energy Administration’s (MEA) Anemometer Loan Program. 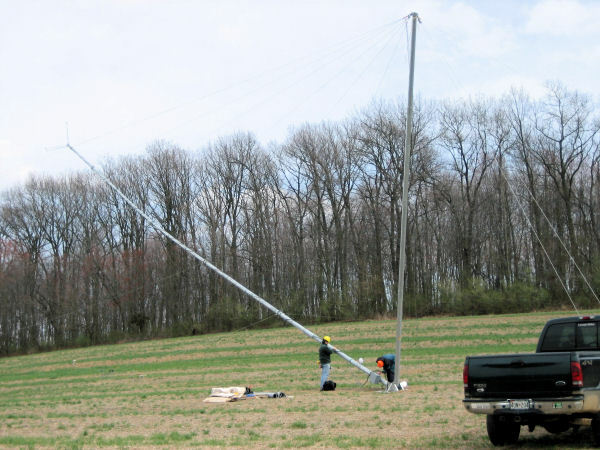 Garrett County was awarded two State-owned anemometer towers which were installed at two County-owned properties in September, 2016. “The Anemometer Loan Program is an excellent resource for local governments, businesses, and non-profits interested in community scale wind projects,” said Mary Beth Tung, Director of Maryland Energy Administration. “The program offers a wind resource site assessment study, at no cost to the host, which drastically reduces up-front risks associated with developing wind projects,” she continued. Anemometer towers collect wind speed, temperature, and other important meteorological data which is used in analyses of proposed project locations. These analyses help inform developers if a proposed location has enough wind resources available to make a project economical. Each study can cost up to $20,000 which is a high price to pay if the analysis reveals that the proposed project location does not have ample wind resources to support a project. Maryland Energy Administration is proud to provide the anemometer equipment and analysis of data to communities interested in exploring renewable wind projects. The initial cost for research is burdensome for many communities seeking to advance their energy supply options. The Anemometer Loan Program is a prime example of Maryland’s commitment to encourage clean energy technology across the state. Garrett County is participating in the Anemometer Loan Program to determine if the Swanton and Grantsville locations can support a community wind turbine. Garrett County is pursuing community wind in an effort to diversify its energy portfolio, especially during winter months while reducing electricity costs for the County over the next two decades. “The County is considering future wind energy development to supplement the three-ground mount solar arrays coming online later this spring,” said Brian Bowers, Purchasing Agent, Garrett County Purchasing Department. “When sunshine is in short supply, especially during those long winter months, wind energy could be a major asset to the County’s renewable energy efforts,” he continued. 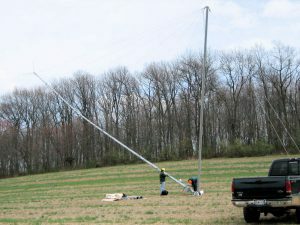 Installation of a 50-m anemometer tower as for a Maryland Energy Administration wind study. A number of local governments across Maryland have participated in the Anemometer Loan Program in recent years to find new avenues of cutting costs. “Crisfield City, MD recently commissioned a community wind turbine which should generate enough electricity to offset the entire annual load of the City; making it one of the first municipal governments in the United States to become net-zero,” said Samuel Beirne, the Maryland Energy Administration Wind Energy Program Manager. “I expect more local governments will become interested in community wind now that it’s been proven in Maryland,” he further stated. The Maryland Energy Administration offers additional grants for wind energy for residents, businesses, nonprofits and government organizations. Visit www.energy.maryland.gov for more information and a full list of grants. On behalf of Governor Hogan the mission of the Maryland Energy Administration (MEA) is to promote affordable, reliable and cleaner energy for the benefit of all Marylanders. To achieve its mission, MEA advises the Governor, General Assembly on matters relating to energy policy. MEA administers grant and loan programs to encourage clean energy technologies in all sectors of Maryland’s economy: Residential, Commercial, Agricultural, and Transportation. For more information about the Maryland Energy Administration, visit www.energy.maryland.gov.